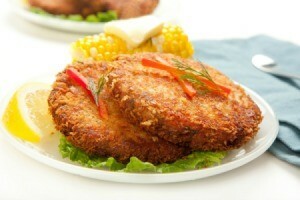 This is a guide about fried salmon patties. Stretch a can of salmon with other ingredients to make delicious fried patties for dinner. Drain 1 can of pink salmon, with bones for calcium. Dump the salmon into a large bowl and mash with a fork. Add about half a big onion, chopped, or sprinkle in some dried onions. Add about 1/4 to 1/2 cup dried bread crumbs. Season to taste with salt and pepper, and form flat, palm-sized patties out of the salmon mixture. Heat about 1/4 to 1/2 cup vegetable or canola oil in a non-stick skillet.. You may need to add more oil as the patties fry. When the oil is heated, put the patties in and fry on each side until golden brown. Drain on a plate covered with a paper towel. My adult children still request fried salmon patties when they and their children are here during mealtime. My recipe is very basic and simple, which may explain why almost everyone asks for the recipe. Many folks don't like, or have digestive issues with, onions and spices so I've never included them. 1 can of salmon (14 to 16 oz size) Do not drain! Dump the salmon into a bowl, liquid and all. I used to discard any excessive slick black fish skin because the kids thought it was gross, but it's okay to leave it all in, bones and all. Mash and break up the salmon and bones with a fork. Add the egg (or eggs). Stir the mixture very well. Take the crackers and crush them as fine as you can. I use my blender. Save about 1/3 cup of the fine cracker crumbs in a small shallow dish or pan. Dump the remaining fine cracker crumbs into the bowl with the salmon and egg. Stir until blended. Heat enough solid shortening (Crisco or lard) in a large skillet so that the bottom is covered to about 1/8 inch depth. The skillet needs to be hot to moderately hot. Scoop up a small egg sized portion of the salmon mixture, form into a ball, roll around in the reserved cracker crumbs, place in the hot skillet and do a quick "mash" with your fingertips to flatten the ball. Work quickly. By the time I put the last patty in the skillet it is time to turn the first one over! They need to be turned over as soon as they are a crisp, golden brown. You may need to add additional shortening to the skillet so they brown well on the second side too. When the second side has browned they are ready to eat! Serve hot! This makes a nice sized platter of patties. The salmon liquid and additional crackers really stretches the salmon without affecting the taste. It was a law around here that these be served with a skillet of fried potatoes and a big bowl of chilled applesauce plus any other vegetable which I was allowed to choose! And yes I know, fried foods aren't healthy, but this sure filled up and satisfied hungry tummies when times were hard. We love salmon patties. I make the way my mom made when I was growing up and that is a can of salmon mostly drained, just leave a little of the juice, skin and bones removed, add a chopped small onion and 2 pieces of torn up bread. Mix well, form into patties, dip each patty in flour and fry in hot oil. I have never put egg in mine, nor did my mom. Once I tried it using an egg and we didn't like the taste as well. They still hold together fine w/o the egg. I buy Pillar Rock pink salmon and usually get it on sale so it's a tasty and cheap meal. We like macaroni and cheese (preferably homemade) and spinach served with them. Yum, I think I'll have to make some soon....they are sooooo good! I love these things too. I always made them with pink salmon, onions, cracker crumbs, eggs, Tabasco and Worchestershire sauce. Years ago I used to buy jack mackeral for my cat; never considered eating it myself. An old neighbor said he loved it in fried patties just like salmon. I tried it and it was very good... a bit stronger than salmon but I liked it. Years later I tried making my patties using instant potato flakes instead of cracker crumbs and I like that much better.